The faith of our fathers that we ourselves have appropriated has taken root in our land. As the faith keeps growing it becomes expedient to have more autonomous churches with priests who will provided the much need pastoral care for the people of God. It is against this backdrop that the Bishop of Uromi Diocese, Most Rev. 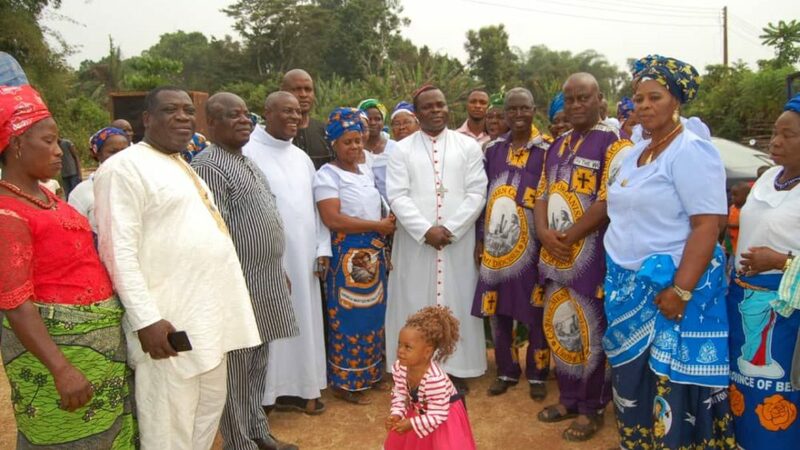 Donatus Ogun elevated Holy Trinity Catholic Church, Egbele Uromi to the status of an Independent Mass Centre with Sacred Heart Catholic Church, Utako Uromi as an outstation under it. This elevation took place on Sunday, 30 December 2018. Prior to this time, the new Independent Mass Centre and its outstation were outstations under St. Anthony Cathedral, Uromi. Within the last four months, three new Mass Centres have been created in Uromi Deanery. The other two are: St. Ignatius, Uzegua-Efandion Uromi and St. John, Uroh Uzea. During the Holy Mass in the course of which the elevation was proclaimed ,Very Rev. Fr. Richard Oboh, Cathedral Administrator and the Dean of Uromi Deanery who represented the Bishop welcomed all sons and daughters of Egbele and Utako communities as well as friends of these communities, especially parishioners of the mother Church, St. Anthony Cathedral who came for the celebration. In his homily, Very Rev. Fr. Richard Oboh remarked that the day was a day of double blessings for the communities. This is because the celebration of the feast of the holy family was equally marked on that day. He admonished the parishioners of the new Mass Centre to take everything about the new Mass Centre serious adding that to whom much is given much is expected. reflecting on the feast of the holy family, he exhorted the faithful on the need to make our families holy, just like that of Jesus, Mary and Joseph whom the Church presents before us as a very good example to emulate. Continuing his reflection, he made it clear that like we, Jesus, Mary and Joseph equally went through pains and sufferings. In the midst of all these, however, they still were able to make their family holy. Consequently, in whatever anybody is passing through today, it is important to know that no one is alone in his/her struggles. Jesus, Mary and Joseph are with us to sustain and intercede for us. As fathers, mothers and children, we should strive live to up to our responsibilities. When we do this, we will have a holy family. By way of conclusion, he advised all the parents present to always stay close to their children and be interested in knowing how they get their money so as to prevent them from following the way of evil. Immediately after the homily, Rev. Fr. Richard Oboh, on behalf of the Bishop, officially handed over the keys of the Church and other materials to Rev. Fr. Obro Robert, SMA, the priest-in-charge of the new Mass Centre. Rev. Fr. Robert Obro expressed gratitude to God, to the Bishop and to everyone present. The lay faithful later danced to the altar in thanksgiving to God for making them an Independent Mass Centre, something which they have long been waiting for. In his address, Sir J. Usifoh, the Laity President, presented the history of the outstation which has grown to become a Mass Centre. He pledged that they will also give the priest-in-charge the same support they gave to the priests who administered the Church till that moment. In his closing remark, Very Rev. Fr. 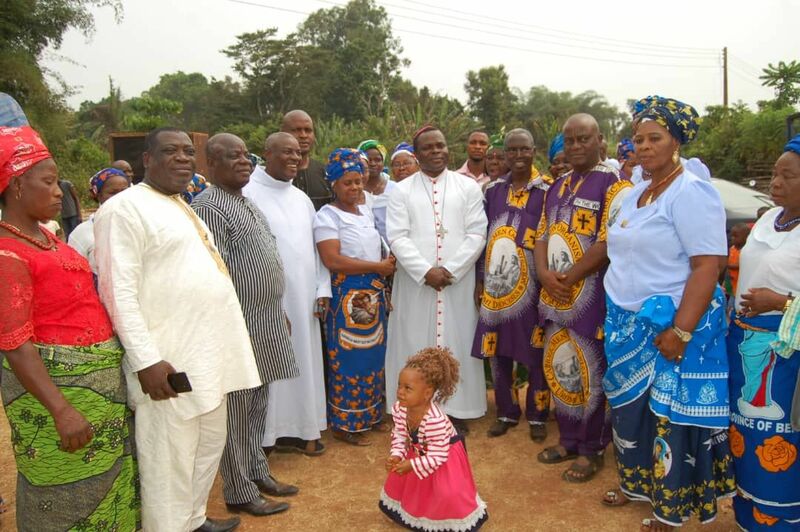 Richard Oboh, in his capacity as Cathedral Administrator, thanked the faithful of Holy Trinity Catholic Church and Sacred Heart Catholic Church for the love and support they gave to him and his assistants all through the two and a half years they administered the Churches. After the Mass, there was light refreshment outside the Church. The reception featured dance drama and comedy. Just before the end of the ceremony, the Bishop who earlier had a pastoral engagement at the Cathedral later came to the Church to felicitate with them and give them his fatherly blessing. In his speech, he congratulated the sons and daughters of Egbele community for their new status. He noted that he would have come personally to celebrate with them but for the other pastoral activities at the cathedral he was unable to come earlier hence he was ably represented by the Cathedral Administrator. The closing prayer and blessing was said and given by the Bishop. To God be the glory for the great things He is doing in Esanland.